Registration for the exciting Upward Basketball and Cheerleading League is here! Our sports league is for boys and girls, K5 through 8th grade. Our goal is to provide a first-class sports experience that emphasizes healthy competition, sportsmanship, skills building and fun versus the " win-at-all-costs " mentality found in many children sports leagues. A unique substitution system which guarantees every child equal playing time. We will be teaching both athletic skill as well as values for success on and off the playing field. We prioritize a family friendly schedule by conducting one-hour practices and games each week. With supportive coaches and a positive sports environment, we strive to bring out "the winner" in every child regardless of the game's score. The MUMSM Upward Basketball program at Mountainside is a unique blend of solid instruction in the game, a basic understanding of competition and what it takes to be good as well as training participants. This training is accomplished in a character-driven atmosphere that promises a fun-filled experience. The Rules of basketball are adapted to require balanced competition where all of the teams and players are divided based upon an objective evaluation system. We also require equal playing time and implement a coaches training program that emphasizes character as a pre-requisite of success as well as game rules which encourage equitable involvement at all levels. The game itself consists of six periods (eight minutes each and three periods in each half), mandatory substitution rules with all players starting a minimum of one game. All of the above plus skull sessions and a one hour per week practice create a landscape of fun that is unparalleled in recreational/educational activities. Every child who participates in basketball and cheerleading must attend one Evaluation Day. All evaluations will take place in the Mountainside Activity Center, or MAC. During evaluations, children will be sized up for their uniform. Cheerleaders will participate in an orientation and discuss season expectations. Basketball players will participate in skill set drills to help with team development. It's great fun! The cheerleaders evaluations will be at the same time. Make plans to attend one of the following evaluation days given in the Schedule. Simply go to the REGISTRATION section of this website, read the information there and register. 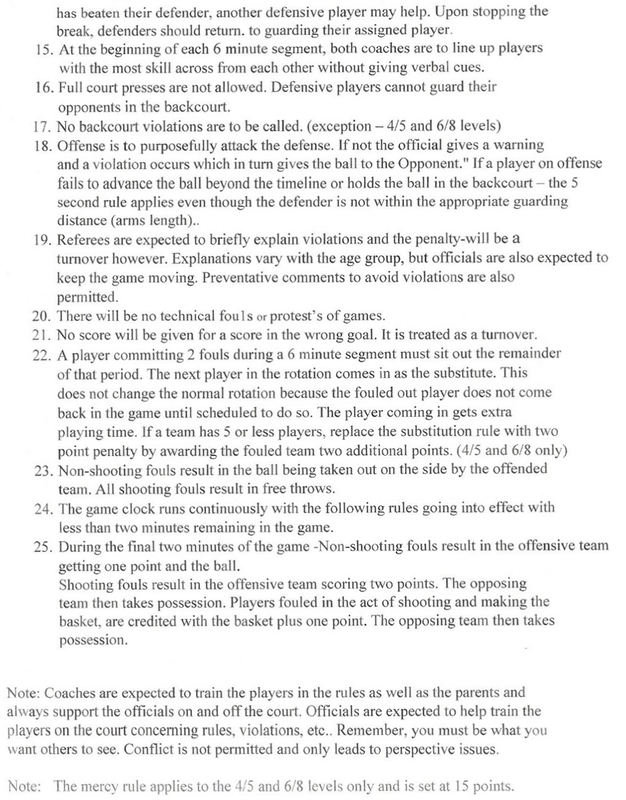 Here is a document on the differences in rules as adapted to Upward. 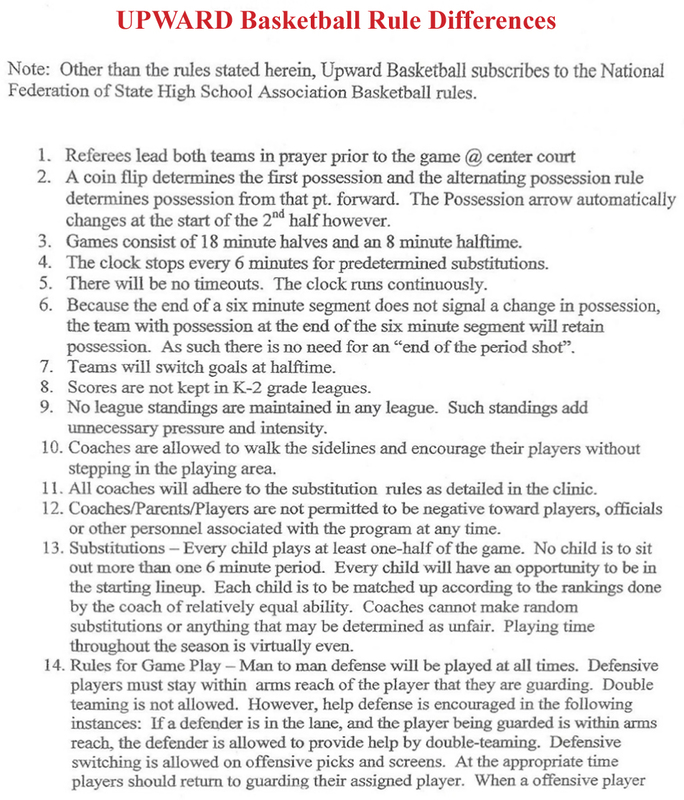 Other than these rules, Upward Basketball subscribes to the Federation of State Hugh School Association Basketball Rules. For a detailed schedule of events, please CLICK HERE. Learning how to spin a basketball will impress anyone. Spinning a basketball on your finger is a hard technique to master, but once you have, you will become a basketball master. Balance your finger before attempting to spin the ball. Practice holding your finger so it is pointed straight up. It has to be perfectly balanced. Once you have the ability to hold your finger properly, try to balance the basketball on your finger without spinning the basketball. Be persistent and donÕt get discouraged. Spin the ball on your finger. Position the ball on your finger and with your free hand, take the top of the basketball and spin it clockwise or counter clockwise. The first couple of times you try to spin the ball, it will just fall. You have to follow the ball when it is spinning with your finger. This is hard to do because the ball is very unpredictable. With practice you will be to follow the ball quickly. Also, try to keep the axis of the ball's spin vertical. Thanks to http://www.animationlibrary.com/sc/98/Basketball/ for the spinning basketball on this page.